Roadmaps are a visual representation of the sequence of changes that must occur when transitioning between two states of an architecture - typically a baseline architecture and a target architecture or an intervening transition architecture. If an enterprise architect is looking for a diagram that will excite executive level stakeholders and senior managers, it is the Roadmap diagram, as it is a tangible deliverable that describes what needs to be done and when. Each architecture domain will typically have a series of Roadmaps that describe the transition between architectures, so there will be Business Roadmaps, Information Roadmaps, Application Roadmaps and Technology Roadmaps. Each one of the domain specific Roadmaps will contain elements pertinent to that domain. So a Business Roadmap might show how Capabilities will be established, changed or phased out. Similarly, an Application Roadmap might show when one or more applications will be retired, replaced or refactored, or when new applications are introduced. A Roadmap could be created that incorporates elements from some or all of the architecture domains to give an enterprise level view of the sequence of changes. 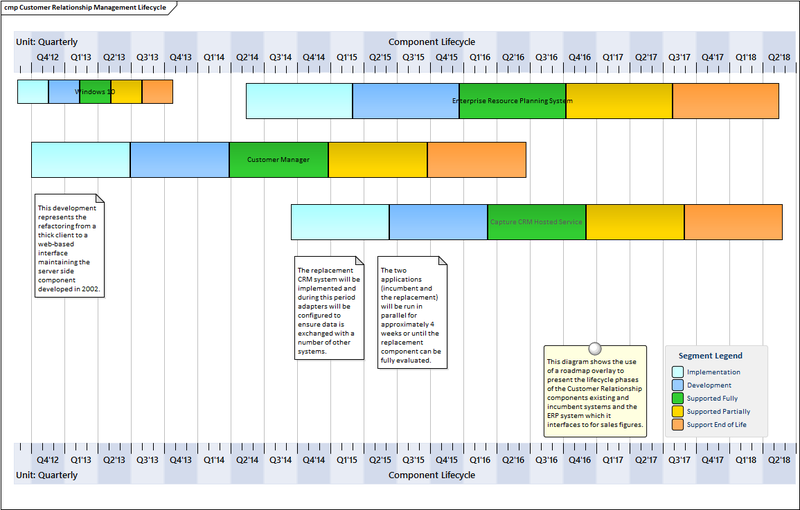 Enterprise Architect has a powerful and flexible Roadmap facility that can be applied as an overlay to any diagram to show how elements of the architecture change over time, including colored bands that represent the state of an element at a given point in time. The meaning and color of each band can be assigned. The position of the element with respect to the diagram's time scale can be altered, and the length of the element and the bands can be changed to express when a particular stage in the element's lifecycle is started and finished. There is a wide range of options available to configure the look of the diagrams, including the timeline properties and appearance, units, tick spacing and more. This section lists the main tools available in Enterprise Architect that can be used to create and manage Roadmaps. There is also a wide range of additional tools that a modeler might find suitable when applying the technique in a particular context. The complete list of tools is available from the topics Meet the Enterprise Architecture Tools and Additional Enterprise Architecture Tools. The Roadmap is an overlay that can be applied to any diagram and can be conveniently enabled or disabled. The overlay presents a timeline that is used to indicate the starting time, duration and finishing time of important phases in the lifetime of the elements on the diagram. It is particularly useful for describing transitions between a baseline and a target or transition architecture. Any diagram object can appear on a Roadmap diagram, including Business Capabilities and Capability Increments, Applications and Services, and Physical or Virtual servers described in a Technology Architecture. The appearance and properties of the timeline can be altered to set the Units, Tick Spacing (Year, Months, Days), Start and Finish time, Colors, Fonts and more. The phases on the elements ca be configured in a diagram legend, allowing names and colors to be defined. Diagram legends can be used with any diagram but they have a particular function with roadmap overlays to define the phases in the lifetime of the diagram objects. Any number of phases can be added and a unique color can be assigned to each phase. The diagram elements will automatically appear with colored bands that can be adjusted in length to indicate the duration of the phase with respect to the timeline. The option 'Use Legend for phase colors' on the 'Roadmap' dialog must be set for the legend to function in this way. Enterprise Architect has a powerful and flexible documentation generator that can produce Docx and RTF Word Processor files, PDF and HTML reports. A Roadmap diagram that is stored in the repository can be conveniently generated and included in documentation. The formatting in element or diagram notes can also be carried through to the documentation. A sophisticated template facility exists that provides a range of built-in templates and also allows the user to create their own templates, defining styles, cover pages, tables of contents, images and a wide range of other formatting options. Visual Filters can be used to obscure or hide elements on the diagram based on user-defined criteria. This is particularly useful with detailed architectural roadmap diagrams that are used to communicate ideas to a wide range of stakeholders. Any number of filters can be created and used to focus attention on a particular part of the diagram, for example to show only applications or capabilities that are being implemented in a particular phase of the architecture or that have a specified status. The filters can be saved and reapplied to the same or any other diagram.